Ever wondered what it would cost to live somewhere in Europe? On Stride Financial gives us a breakdown on the cost of living in one location, based on having £1000 in the bank. Shown down to the final hour, we see just how far into one year you could get before your money runs out. Where would you spend your time? 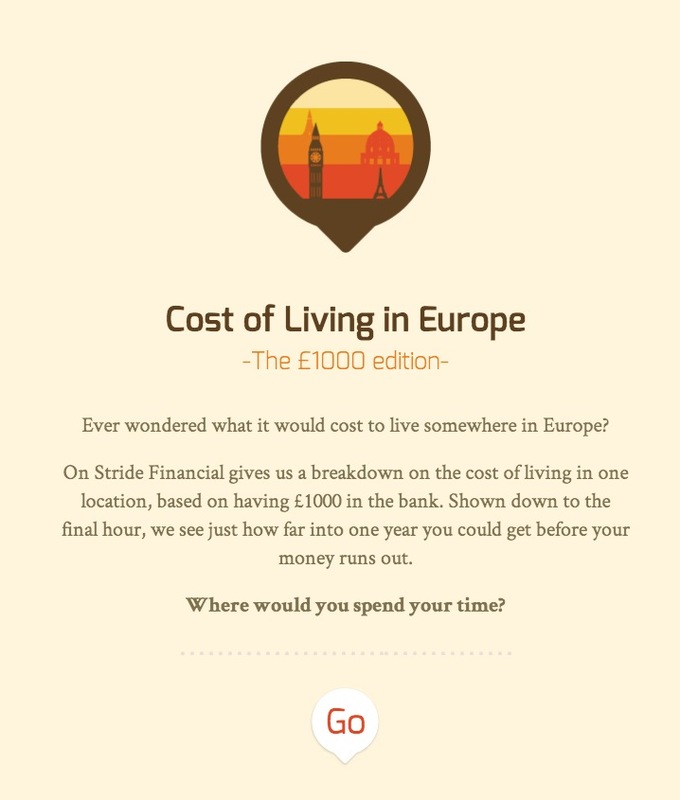 On Stride Financial give a guide to the cost of living in the EU. For each location you can find information on the cost of food, drink, entertainment, travel and accommodation. Visit each of the ten cities on the map to see how much it would cost, by day, to live like a resident; enjoying local cuisine, wine, and the odd trip the museum. See a breakdown of the number of days and even hours you have to enjoy your stay before your £1000 runs out. Where would you spend your £1000?